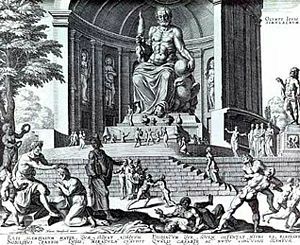 A fanciful reconstruction of Phidias' statue of Zeus, in an engraving made by Philippe Galle in 1572. The Statue of Zeus at Olympia is one of the classical Seven Wonders of the Ancient World. It was carved by the famed sculptor Phidias around 435 B.C.E. in Olympia, Greece. The seated statue occupied the whole width of the aisle of the temple that was built to house it, and was 40 feet high. "It seems that if Zeus were to stand up," the geographer Strabo noted early in the 1st century B.C.E., "he would unroof the temple." The statue was made of ivory and accented with gold plating. In the sculpture, Zeus was seated on a magnificent throne of cedar wood, inlaid with ivory, gold, ebony, and precious stones. In Zeus's right hand was a small statue of Nike, the goddess of victory, and in his left hand, a shining scepter on which an eagle perched. Plutarch, in his Life of the Roman general Aemilius Paulus, records that the victorious general, upon seeing the statue, “was moved to his soul, as if he had beheld the god in person,” while the Greek rhetorician and philosopher Dio Chrysostom wrote that a single glimpse of the statue would make a man forget his earthly troubles. Although the statue itself is lost, in 1958 an excavation discovered the workshop used to create the statue. This has led archaeologists to attempt to re-create the technique used to make the great work. Illustration of the temple as it might have looked in the fifth century B.C.E. 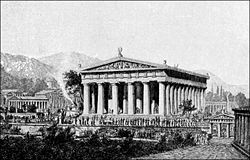 The Temple of Zeus at Olympia was built between 470 B.C.E. and completed by 456 B.C.E. to commemorate the Elean defeat of the Pisatans in 470 B.C.E. It was designed by Lisbon of Elis at Archaeopaedia. Later, it housed the monumental Statue of Zeus, which was added to the temple around 435 B.C.E. The temple was destroyed by earthquake in the fifth century B.C.E. The temple was built from limestone and covered with stucco built on a raised rectangular platform of approximately 210 feet by 92 feet, with 13 33-foot columns on each side and six at either end. The temple was divided into three sections. Olympia not only housed the Temple of Zeus, but also hosted the Olympic Games. Held every four years, the games dated back possibly further than 776 B.C.E. The games quickly gained importance throughout Ancient Greece, reaching their zenith in the sixth and fifth centuries B.C.E. The Olympics were of fundamental religious importance, contests alternating with sacrifices and ceremonies. These rites honored both Zeus, who was said to be presiding over the games, and Pelops, divine hero and mythical king of Olympia, famous for his legendary chariot race, in whose honor the games were held. The number of events increased to 20, and the celebration was spread over several days. The games were held every four years, and the period between two celebrations became known as an 'Olympiad.' In 394 C.E., the Christian emperor Theodosius I abolished the games because of their connection to paganism. Olympia's sanctuary, known as the Altis, consisted of an unordered arrangement of various buildings. Enclosed within the temenos (sacred enclosed area) were the Temple of Hera, the Temple of Zeus, the Pelopion and the area of the altar, where sacrifices were offered. The hippodrome and later stadium stood to the east. To the north of the sanctuary were the Prytaneion and the Philippeion, as well as the array of treasuries representing the various city states. The Metroon lies to the south of these treasuries, with the Echo Stoa to the East. To the south of the sanctuary are the South Stoa and the Bouleuterion, while the west side housed the Palaestra, the workshop of Pheidias, the Gymnasion and the Leonidaion. Zeus (in Greek: nominative: Ζεύς Zeús; genitive: Διός Diós), was the king of the gods, the ruler of Mount Olympus. In Greek mythology he was the bringer of thunder and lightning, rain, and winds. Zeus's symbols were the thunderbolt (his weapon), eagle, bull, and the oak. 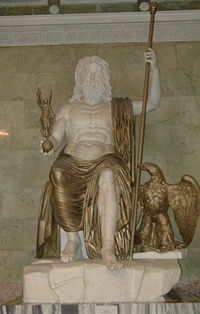 In addition to his Indo-European inheritance, the classical Zeus also derives certain iconographic traits from the cultures of the ancient Near East, such as the scepter. Frequently envisaged by Greek artists in one of two poses, Zeus is most often seen standing, striding forward, a thunderbolt leveled in his raised right hand, or seated in majesty, as in the case of the Statue of Zeus at Olympia. Zeus was also protector of cities, the home, strangers, and supplicants. Statues of Zeus appeared in forecourts of houses all over Greece, while mountaintop shrines attracted scores of pilgrims. The Statue of Zeus at Olympia, located in a sacred grove between two rivers was the most revered object of Zeus' worship. The circumstances of the eventual destruction of the Statue of Zeus at Olympia are a source of debate: One theory suggests it was destroyed by a meteor. Others argue that it perished with the temple in the fifth century B.C.E. Still others believe that it was carried off to Constantinople, where it was destroyed in the great fire of the Lauseion. ↑ Ashmawy, Alaa K. The Seven Wonders: The Statue of Zeus at Olympia. University of South Florida. Retrieved on June 14, 2007. ↑ Lucian's dialogue Timon the Misanthrope Online Reader Works of of Samatosa — Volume 01 by Lucian of Samatosa. Project Gutenberg. Retrieved June 14, 2007. History of "Statue of Zeus at Olympia"
This page was last modified on 2 April 2008, at 16:59.